Clean, comfy beds, clean bathrooms good breakfast. Where to find Auburn hotels near an airport? Where can I find hotels in Auburn that are near tourist attractions? Seeking a warm welcome and a comfy bed in Auburn? Expedia's extensive network currently offers approximately 12 hotels and apartments within a 0.1-kilometre (0.06-mile) distance of the center of town. Our hotels that are within driving distance of Auburn include the Holiday Inn Express Suites Sumner and Best Western Plus Plaza by the Green. The Auburn Travelodge Inn and Suites is a budget-conscious accommodation option. You'll find it positioned 5 kilometres (3 miles) from the center of Auburn. 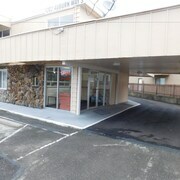 Travelers could also check out the Rodeway Inn Auburn - Seattle. 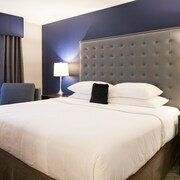 The Hotel Murano, a Provenance Hotel is situated 20 kilometres (13 miles) from the heart of Auburn. 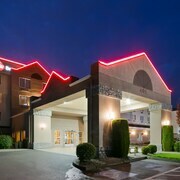 Alternatively, the Courtyard by Marriott Tacoma Downtown is situated 20 kilometres (13 miles) away. 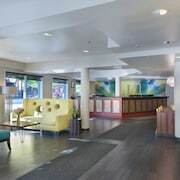 Two other places to stay include the Embassy Suites Hotel Seattle-Tacoma International Airport and the Seattle Airport Marriott. After you have got to know Auburn, why not take the time to discover the many other delights of the Puget Sound area. Puget Sound boasts forests and fjords, and common Puget Sound attractions include lighthouses. Adventurous visitors might also try hiking and quad biking here. Downtown Tacoma is 20 kilometres (13 miles) to the west of Auburn and is where you'll find Foss Waterway Seaport and Museum of Glass. The The Villa Bed & Breakfast and Holiday Inn Express Hotel & Suites Tacoma Downtown are some of the Expedia-recommended short and long-stay alternatives in Downtown Tacoma. 45 kilometres (27 miles) to the southwest of Auburn, you can also stay at Dupont, home to the Hampton Inn and Suites DuPont and Best Western Liberty Inn DuPont. The Home Course Golf Course and Eagles Pride Golf Course are a couple of the popular places to check out while in Dupont. If sport is what you love, be sure to take a trip to Safeco Field, which is 35 kilometres (22 miles) to the north of Auburn. 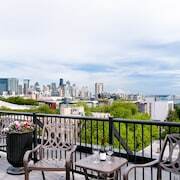 For tourists who are keen on booking accommodation close by, make a reservation in the Four Seasons Hotel Seattle or Seattle Marriott Waterfront. Seattle - Tacoma International Airport is located 19 kilometres (12 miles) away from Auburn. 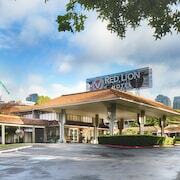 Visitors who wish to stay close by, can book a room via Expedia at the Cedarbrook Lodge or Hilton Seattle Airport & Conference Center. What are the most popular Auburn hotels? Are there hotels in other cities near Auburn? What other types of accommodations are available in Auburn? Explore Auburn with Expedia.ca’s Travel Guides to find the best flights, cars, holiday packages and more!